Для поклонников комфортабельных бипланов фирма разработала самолет DH.87 Hornet Moth, близкий по конструкции к DH.86, у которого оба члена экипажа сидели бок о бок в закрытой кабине. Это был одностоечный биплан с матерчатой обшивкой деревянного крыла, имевшего ДальшеMore>>> небольшое сужение к законцовкам, с фюзеляжем квадратного сечения из сосны и фанеры и с шасси с хвостовым костылем и независимыми основными стойками. Первый прототип взлетел в Хэтфилде 9 мая 1934 года, а во время продолжавшихся более года испытаний к нему присоединились еще два аналогичных самолета. Поставки серийных машин, получивших обозначение DH.87A Leopard Moth, начались в августе 1935 года. Было выпущено более 60 самолетов этой модификации, имевших новое крыло с увеличенными размахом и сужением. 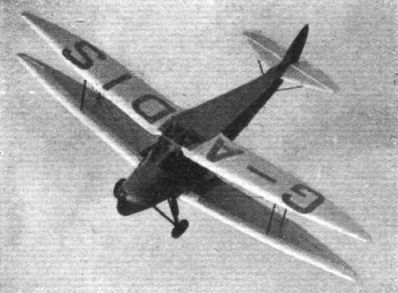 Но в 1936 году был введен тип крыла, впервые опробованный на втором серийном Hornet Moth. Новые несущие поверхности не имели сужения, а их законцовки были практически прямоугольной формы, и их можно было установить на уже выпущенные машины по желанию владельца. Этим крылом оснастили также 100 новых самолетов, получивших обозначение DH.87B Leopard Moth. После того, как фирма "de Havilland Aircraft of Canada" разработала вариант с поплавковым шасси, в 1937 году Министерство авиации приобрело четыре такие машины для испытаний в качестве учебных самолетов. В общей сложности построили 165 Hornet Moth, включая прототип. Everyone eagerly awaits any new machine which comes out of the De Havilland factory. 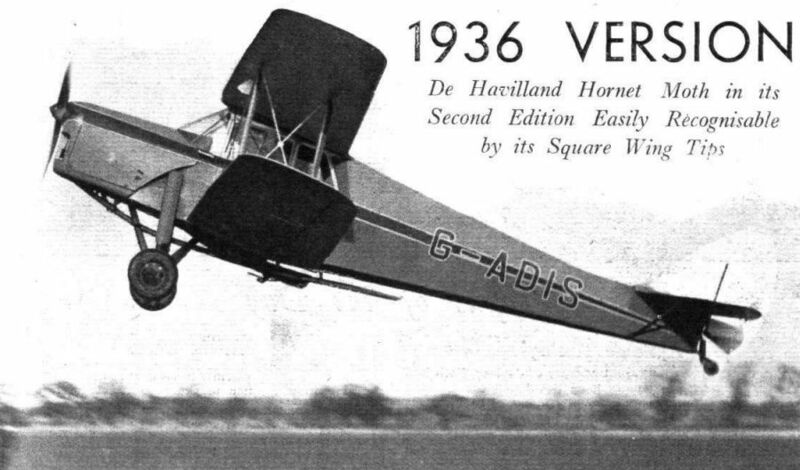 This year their curiosity will be rewarded by the new De Havilland "Hornet Moth." It must be made clear, however, that this machine is not yet in production, nor is it by any means certain that it ever will be put into production in its present form. Actually, it is an experimental machine, which Capt. 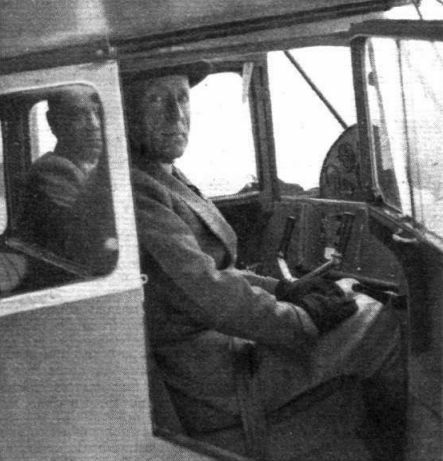 Geoffrey de Havilland has designed in order to try out the ideas he has about what private owners want in the way of a two-seater, side-by-side aeroplane. 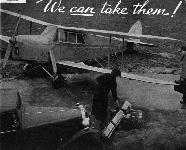 As it is at present, this machine is a small cabin biplane, seating two people side by side in great comfort between the wings. 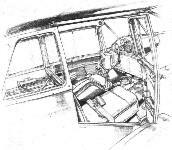 The cabin is as wide as the front seat of any normal middle-weight motor car, and careful attention to the cowling which surrounds the D.H. "Gipsy Major" engine has resulted in an exceptionally clear outlook forward. 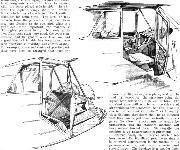 In the past, side-by-side two-seaters have usually been criticised because the pilot could not see anywhere on the opposite side to which he sat, but in this new machine his outlook is certainly no worse than that in most tandem machines, and is undoubtedly better than a great many of them. 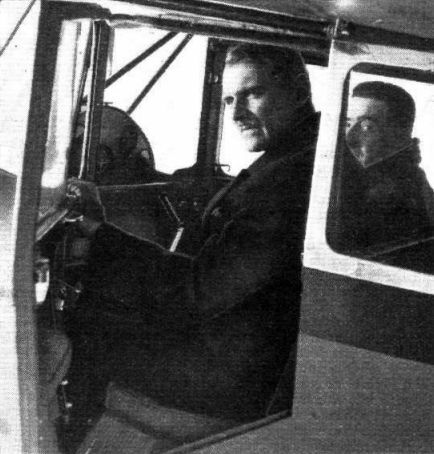 The roof of the cabin has been made transparent, and the side windows carried well back, so that not only can any machine be seen which may be in the air behind and above when taking-off, but also the pilot has no ''blind spots'' when circling the aerodrome before coming in to land. The construction is a combination of accepted De Havilland principles. The fuselage is built up in the same way as that of the "Dragon," and the wings, which may, in any future models, be braced by one strut only between the tips, bear obvious family resemblance to those of the "Dragon Six." The undercarriage has a lot in common with that of a “Leopard Moth," and the nose and windscreen resemble those of the same machine. In fact, the tout ensemble is rather a cross between a "Leopard Moth" and a "Fox Moth," with a dash of "Dragon Six." There are many interesting and ingenious features in this machine. For example, the control column is mounted slightly in front of and below the centre armrest between the two seats. As it is cranked in shape, it falls comfortably into the pilot's right hand - if he is sitting in the left-hand seat - when his elbow is on this armrest. The doors are bowed outwards, thus giving both pilot and passenger plenty of room for their "outboard" arms, and it is also possible to slide one-half of the window in each door forward and one-half backward, thus probably obviating any draught in the cockpit. New De Havilland machines have a habit of winning trip Kind's Cup Race, a fact which will make this popular designer's latest product the cynosure of all eyes on Friday. D.H. "GIPSY MAJOR," 130 H.P. ENGINE. THE first "Hornet Moth" made its public appearance last summer, when it took part in the King's Cup Race, piloted by Capt. G. de Havilland himself. 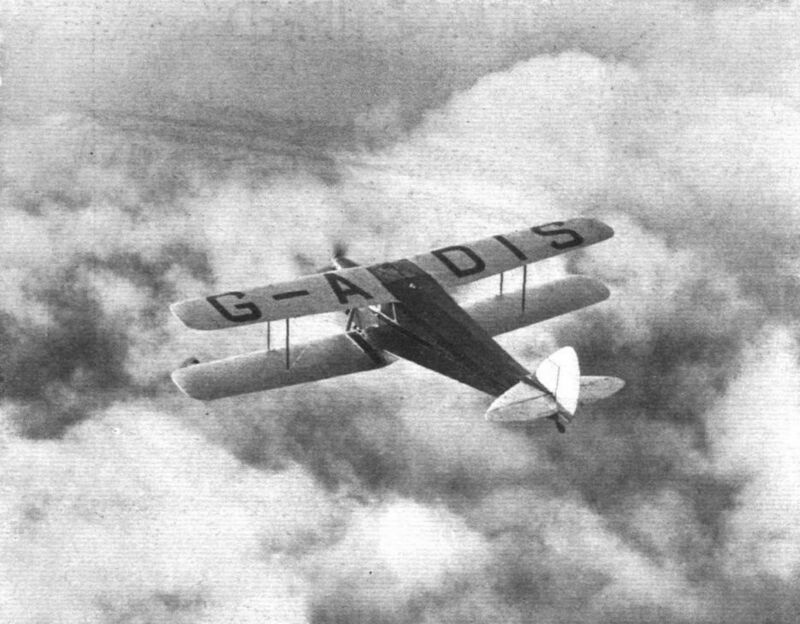 The machine was an experimental model only, and the De Havilland Aircraft Co., Ltd., has now spent a whole year in flight-testing it and two other experimental machines before being satisfied that they have evolved an aeroplane as nearly perfect for its purpose as possible. Hundreds of hours have been spent in flight-testing, and every aerodynamic characteristic and mechanical feature tried and re-tried. When, therefore, the firm now announces itself satisfied with the machine, it is reasonable to assume that all the "bugs" have been removed, and that the "Hornet Moth" goes into production as a fully tried type. As stated in Flight a fortnight ago, elaborate preparations have been made for quantity production and it is expected that the flow of output will begin in August. 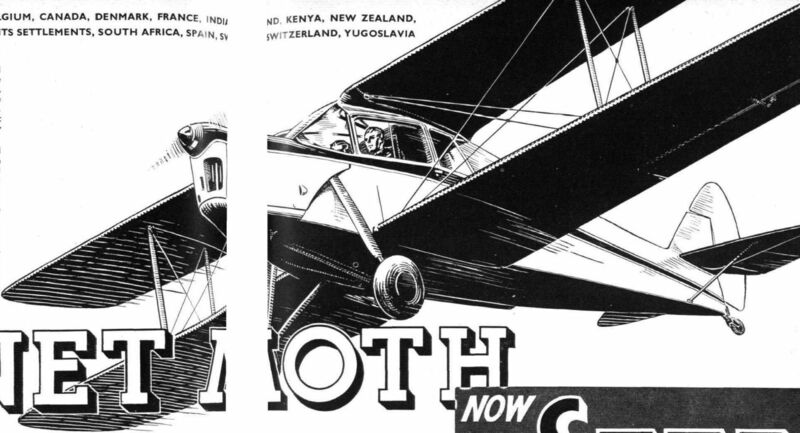 In its general conception the "Hornet Moth" - which, incidentally, is the eighty-seventh De Havilland design - is a cabin biplane two-seater, with the seats placed side-by-side. In plan form the biplane wings show the graceful taper which has characterised De Havilland machines for some time. 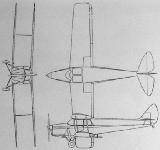 The lines, as maybe seen from the general arrangement drawings, are pleasing to the eye, and, what is a great deal more important, the machine is thoroughly pleasant to fly. 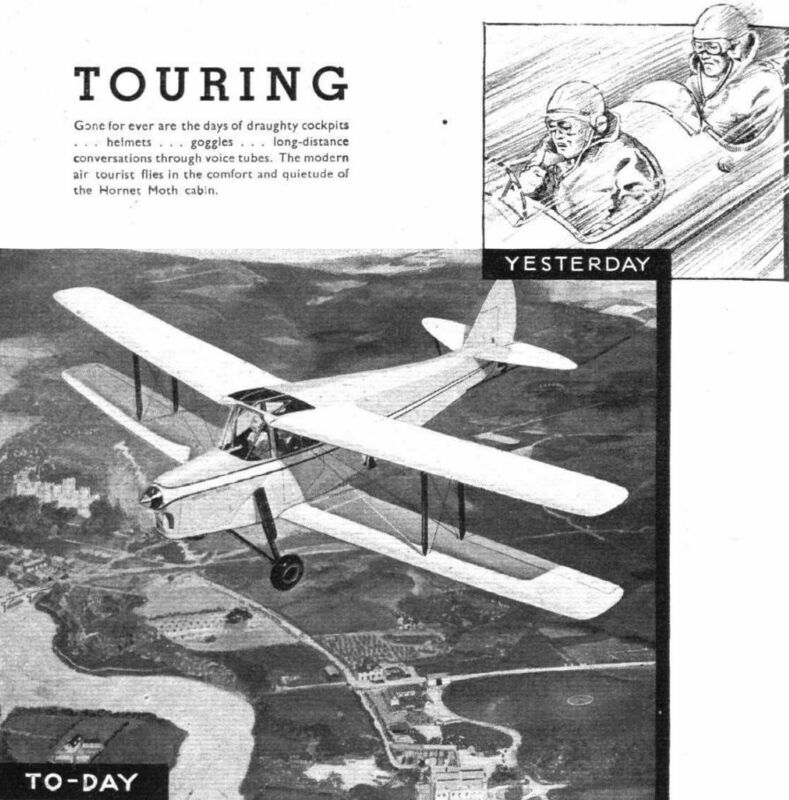 Not only is the view from both seats very good, the seats comfortable, and the general noise level low, but a great deal of trouble has been taken over such questions as stability and controllability. For example, areas and centre of gravity positions have been so arranged that once the machine is in the air there is no necessity to use the rudder at all. Ordinary flying manoeuvres can be carried out perfectly by the use of elevators and ailerons only. This means that on a cross-country flight the pilot can take his feet off the rudder pedals and control the machine entirely with the "stick." 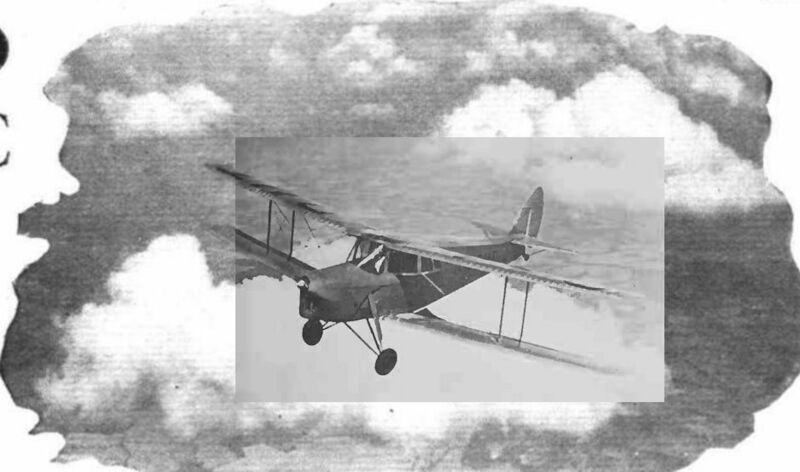 Provided he keeps sufficient altitude to clear any obstacles on his route, he should be able to fly through fog, cloud and rain without any fear of getting his machine into a dangerous attitude. On the "Hornet Moth" the rudder can, in fact, be regarded solely as a ground control. 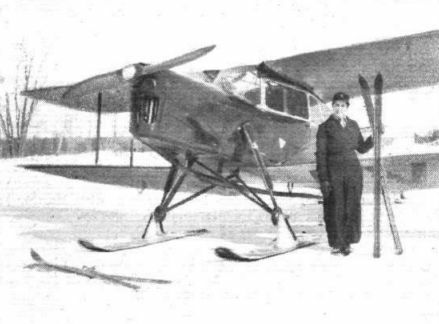 In many cases it might even be possible to take off and land the machine without using the rudder, but as there is always the possibility that a swing may be started, by one wheel striking some small obstacle or unevenness on the ground, for instance, it is still considered necessary to fit a rudder to correct such swings. If the rudder is used during flight, the "Hornet Moth" will, of course, have the same manoeuvrability as any aeroplane, and can be used for aerobatics, the structure being designed with sufficiently high load factors. 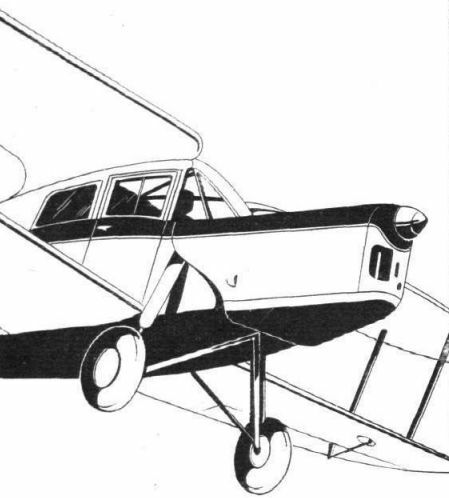 The standard type will not have a certificate of airworthiness for aerobatics, but this is merely due to the fact that Aerobatic C. of A. regulations demand that doors shall be so designed that they can be jettisoned instantly in emergency (to allow the occupants to escape by parachute), and the standard machine will have normal hinged doors. Structurally the machine is up to aerobatics requirements. 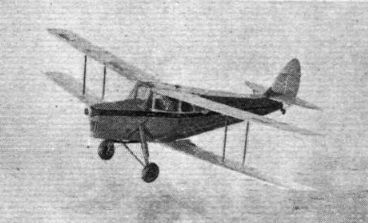 Constructionally the "Hornet Moth" follows normal De Havilland practice in that it is of wood construction in the matter of its primary structure, with fabric covering and steel fittings. The fuselage is a wooden box, with light longerons and struts covered with plywood. On to the outside of the plywood are secured longitudinal stringers, which support the fabric covering. As these stringers project beyond the plane of the plywood, the external form of the fuselage is somewhat rounded, giving hotter aerodynamic form. Inspection doors are provided at intervals in the floor of the fuselage so that the interior can be examined. The biplane wings are of normal two-spar construction, with spruce spars spindled to an I-section. Over the inner portion of the wings front and rear spars are parallel, but they converge over the outer portions and meet at the wing tips. Over this portion, by the way, the spars are solid spruce. 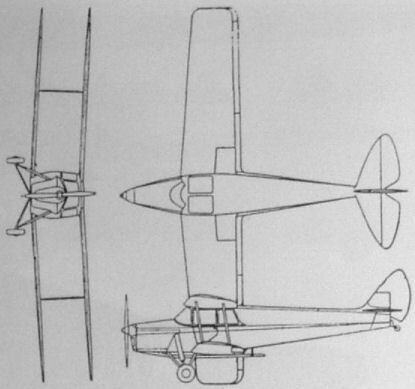 One pair of inter-plane struts on each side joins top and bottom planes. They are steel tubes of streamline section. The wing bracing is so arranged as to terminate at the fuselage in the plane of the front spars, thus running clear of the door and facilitating getting into and out of the cabin. 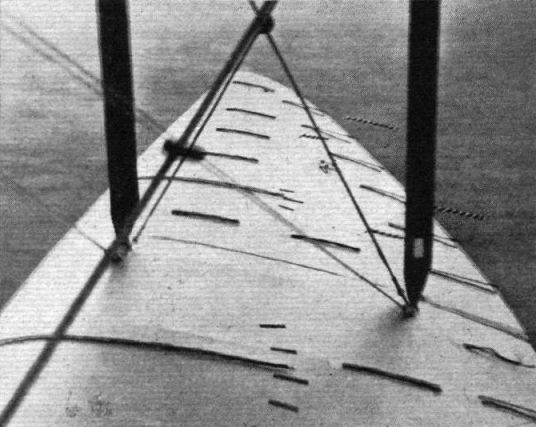 Ailerons are fitted to the lower wing only and are of orthodox type. The wings are arranged to fold, the overall width of the machine for storage being thus reduced to 9 ft. 6 in. The tail surfaces are of normal De Havilland construction, i.e., wood with fabric covering. The only notable change from previous machines is the introduction of trimming "tabs" on the elevators instead of fitting a trimming gear for the tail plane. Needless to say, a castering tail wheel is fitted. As already mentioned, the two seats in the cabin are placed side by side; they are very comfortable and allow plenty of room. The seats are placed on a box structure, inside which can be carried tools or other equipment, such as batteries for electric starting, etc. If the machine is desired to have fairly long range, an extra petrol tank of 8 1/2 gallons capacity can be fitted in this space. Behind and above the seats is the main luggage space, 23 1/2 in. deep, 28 in. high, and 38 1/2 in. wide. Underneath this large luggage shelf is the main petrol tank, which is, of course, isolated from the cabin. It has a capacity of 35 gallons. Underneath the instrument board there is another space, which can be used for maps and various odd articles likely to be required on the journey. A rounded one-piece windscreen closes the front of the cabin, while the windows at the side are of the sliding type for ventilation or view during landing in rain. 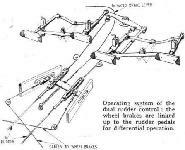 Dual controls are fitted, the "stick" being fitted with two branches, one for each occupant. If it is intended to use the machine for school work, a second set of engine controls can be mounted on the starboard side of the cabin. 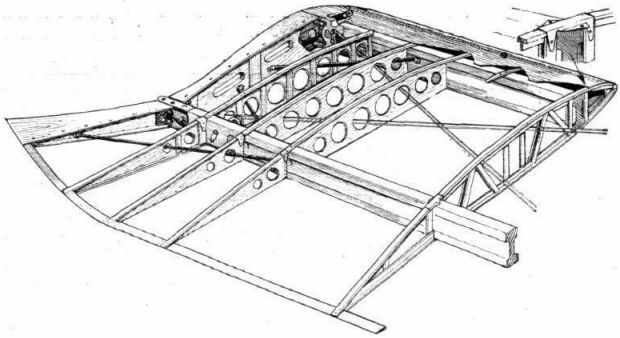 The undercarriage has a wide track, the axle and radius rods being hinged on the bottom centre line of the fuselage, while the compression strut is taken to the top longeron. The compression strut has a long stroke and is fitted with a streamline fairing of large chord, so mounted that it can be rotated around the strut, thus forming an air brake. Dunlop wheels are fitted, with Bendix wheel brakes. 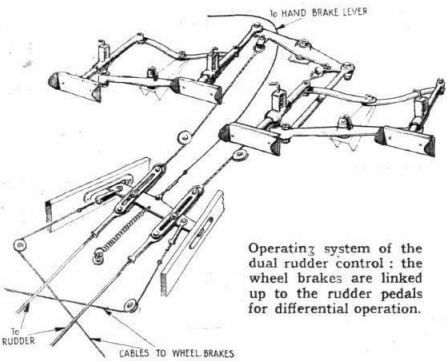 The latter are operated in the usual De Havilland way; both brakes are applied by a single lever, but are connected up to the rudder pedals in such a way that when these are worked after the brakes have been put on they release one or other of the two brakes, thus making the machine very manoeuvrable on the ground. A 130 h.p. 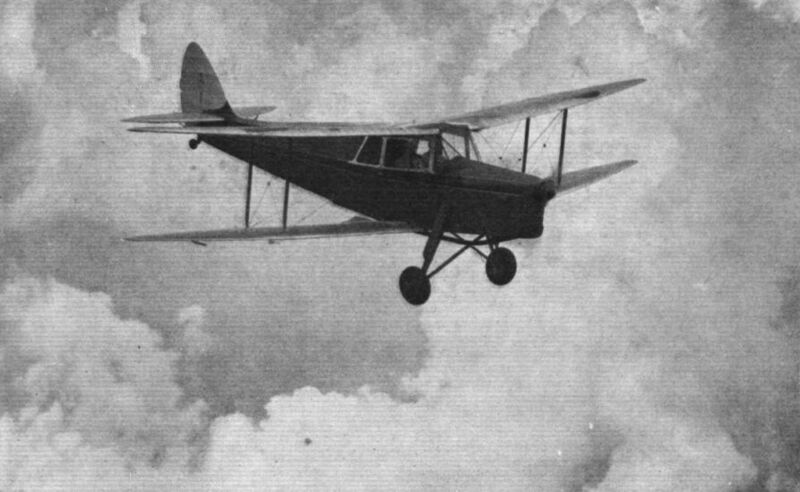 "Gipsy Major" forms the standard power plant for the "Hornet Moth." It is mounted on the usual steel tube structure and drives a wooden propeller of the sheathed type, made by the Airscrew Company, of Weybridge. The position of the main petrol tank is such that it would not give direct gravity feed to the engine at all angles, and petrol is, therefore, carried to the engine by duplicated engine-driven petrol pumps. The "Hornet Moth" is to be marketed at a price of ?875, with standard equipment, which includes the following Smith's instruments: Air-speed indicator, revolution indicator, aneroid, oil-pressure gauge and Husun Mark IIIa compass. 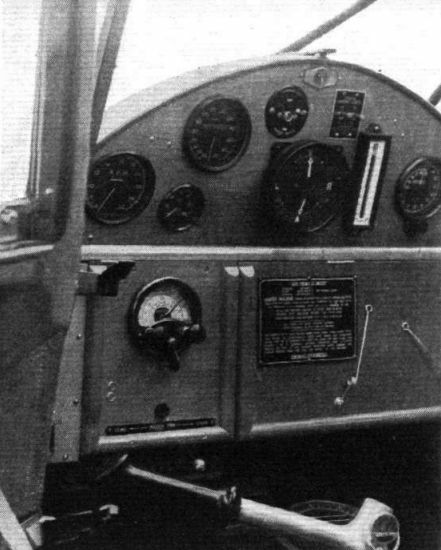 A bubble-type inclinometer is also fitted as well as a De Havilland strut-type air-speed indicator. 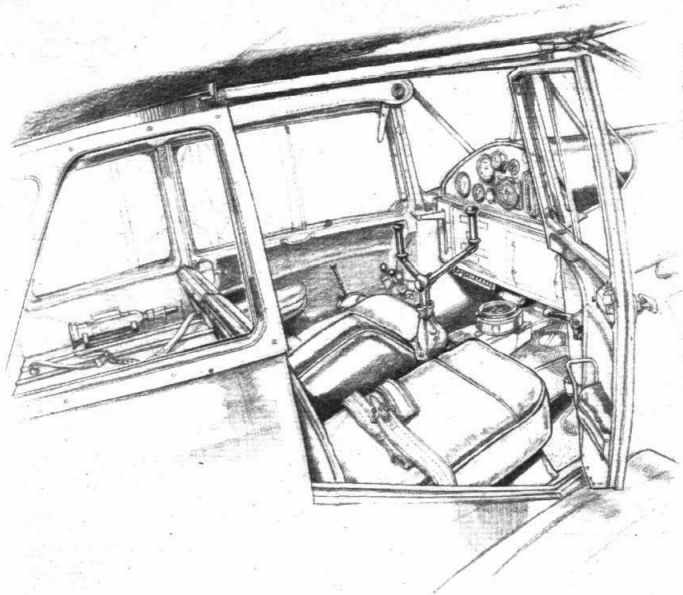 Standard cabin furnishings will include pilot's and passenger's seats, cushions and back squabs; thigh straps and pilot's safety belt; floor carpet; locker below instrument board, fitted with spring clips for maps; black Doverite finish of all control handles; grey walnut instrument board; sun-blind. The cabin upholstery will include neutral colour rep cloth with leather piping; cushions and squabs filled with rubberized hair; carpets to tone with the upholstery. The approximate performance figures are shown in the accompanying table. The range given is that with the standard tank of 35 gallons capacity. If the 8 1/2-gallon tank is fitted in the box under the seats the range is increased to 817 miles. WHEN we have all exhausted the subject of the "ideal light aeroplane," the fact still remains that every one of the six hundred owners and of the thousands of pilots in this country has a different idea. When, last year, the De Havilland Company introduced the Hornet Moth and, so to speak, put their shirt on it as a trainer as well as an “owner,” they did so with the knowledge that it would be impossible to please everybody. Not to put too fine a point on the matter, they very nearly failed to please anybody - such is the cumulative effect of idle gossip. The points have now been removed and the gossips should have been silenced! It would be difficult for anyone to criticise the 1936 Hornet as an up-to-date training type, or for the most careless owner to pirouette on a wing tip. 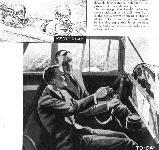 Furthermore, the machine retains all those flying characteristics which made the, '35 model so pleasant on a cross-country flight. Last week, while flying the new Hornet, I made six landings and at least three of them were tackled with deliberate carelessness. Two were made straight off a 50 m.p.h. final approach - the machine can be safely glided at this speed, though 60 m.p.h. is a preferable pace. On my last I held off at an estimated three feet, which turned out to be about four or five, and, in spite of the fact that a gusty breeze was blowing, there appeared to be no tendency for the machine to do more than drop straight down on a level keel. Previous experience with the earlier model had, of course, taught me to bring the stick back in a parallel movement. It certainly appeared to me that it would be possible to carry out a landing according to a book of rules - holding off until the A.S.I. showed a speed of less than 50 m.p.h. and then pulling the control gently back. During the flying intervals, I made various stalling experiments at a safe height and found that the Hornet would float indefinitely without dropping its nose at an indicated air speed of 40 m.p.h. so long as the stick was not pulled right back. With the control in one's stomach the nose alternately rose and fell, but a wing did not usually drop for at least ten seconds. A sudden backward movement sometimes precipitated a complete stall and the nose would tall quickly until speed was regained. Either rudder or aileron would lift a falling wing, though the whole machine was, naturally enough, in a somewhat unstable condition. In brief, the natural stall did not appear to be at all violent and some control remained throughout all stalled manoeuvres. 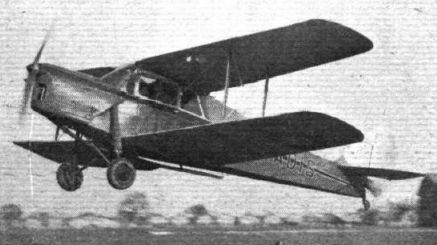 Although the ailerons are slightly more sluggish in the new Hornet, its flying characteristics are, as already remarked, similar to those of the 1935 model. Correct turns can be made with the stick alone, and I found that, after a little practice and after trimming the machine directionally at cruising revolutions, it was possible to work up to an almost vertical turn and to recover therefrom with my feet on the floor while the "sideslip" needle of the turn indicator remained absolutely central. "Rudder only" turns were made with rather less accuracy. Finding a really solid mass of cloud between 4,000 and 5,000 ft. I made several interesting experiments in blind flying. Again without using the rudder it was possible to turn on to different courses with accuracy and to hold a constant rate of turn without difficulty. On the rudder alone the speed tended to increase rather badly on any but very gentle turns. 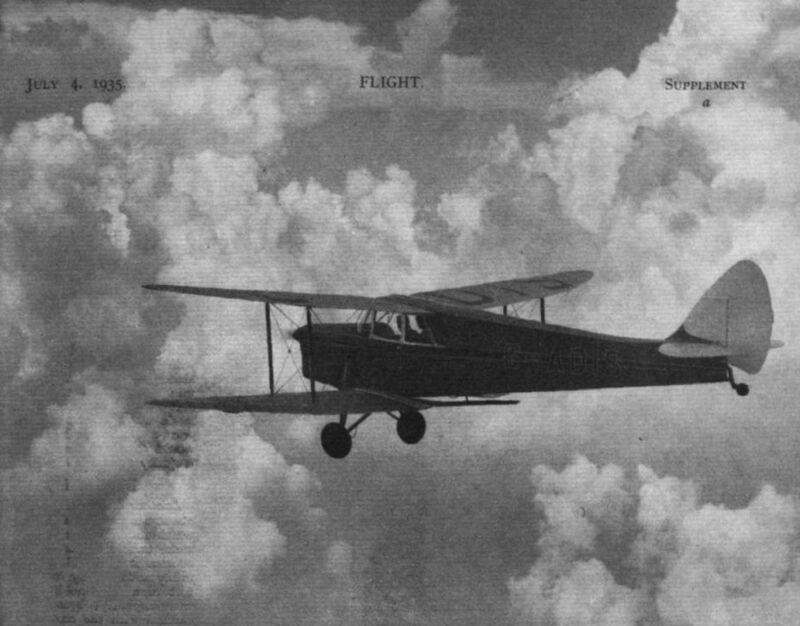 The business of flying straight and level in a cloud is the easiest in the world, and I hardly found it necessary to use the turn indicator - which, nevertheless, was essential as a psychological comforter. One up, with luggage consisting of one soft hat and a pair of gloves (who would fly an open aeroplane?) and without trying very hard, an altimeter height of 1,000 ft. was reached in a few seconds over the minute from a standing start. Actually the climb, at an air speed of 50-55 m.p.h., is quite phenomenal, and the take-off run into a wind of perhaps 15 m.p.h. did not appear to be more than a hundred yards or so. For a biplane the approach angle is surprisingly flat until the air brakes are used. Most people would probably prefer these to be even more potent, though the Hornet sideslips with the virility customary in all D.H. machines. Only on my first approach did I find it necessary to use more than a shade of flat slip at the very last moment in order to put down just beyond the prohibited area at Hatfield. Nobody would need to have any hesitation about using a small landing ground with the good take-off and safe-slow approach. One feature of the new Hornet is worth its place in the final paragraph - the mirror. It is large, quickly adjustable and gives a complete view of the sky and horizon behind. There will now be no need to swing round on a wheel to peer at the sky before opening up for the take-off. Weight (including standard equipment) 1,255 lb. Length overall 24 ft. 11.5 in. Span (with wings folded) 9 ft. 9.5 in. Maximum speed at sea level 121-124 m.p.h. Cruising speed at 1,000ft. and at 2,050 r.p.m. 103-105 m.p.h. Endurance (with normal tanks) 6 hr. Take-off run in 5 m.p.h. wind 135-175 yds. Climb to 5,000 ft 8.25 min. AS the lineal successor of the series of machines which, to a very large degree, made private and club flying possible in this country, the D.H. Hornet Moth is one of the most interesting machines in the light aeroplane class. It represents the fruit of unrivalled experience in the needs of the private and club market, and is, withal. a very delightful machine to fly. All normal evolutions, up to a near-vertical turn, can be carried out on the stick alone, and, with the new wings, the stall is innocuous enough to rid bad landings of minor dangers. The machine is quiet, so that a pupil and instructor can converse normally, and the view in the forward hemisphere is particularly good for a single-engined machine. The cabin is roomy and there is ample space for luggage behind the two seats. Even the most cautious pilot will be glad to feel that the Hornet has been stressed for aerobatics, though such antics are not legally permissible without alterations to the door fittings to facilitate parachute departures. 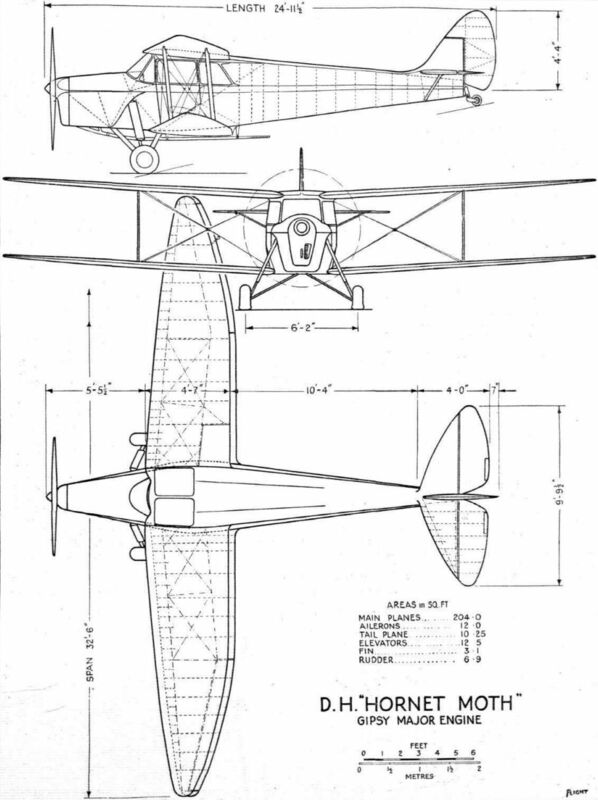 The specification of the Hornet Moth is as follows: Weight empty, 1,255 lb. ; disposable load, 695 lb. ; folded span, 9ft. 9in. ; length, 25ft. ; maximum speed, 121-124 m.p.h. ; cruising speed, 103-105 m.p.h. ; landing speed, 40 m.p.h. ; climb to 5,000 ft., 8.25 min. ; endurance, 6 hr. ; price ?875. 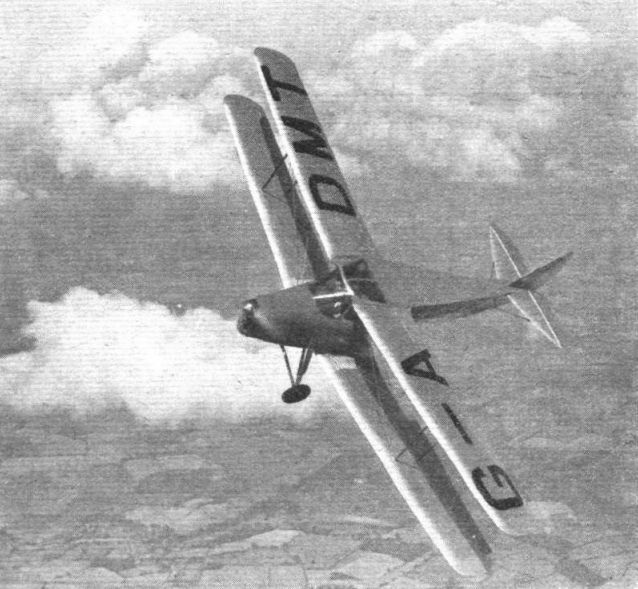 Начав с DH.60 Moth, Джеффри де Хэвилленд спроектировал серию своих знаменитых легких самолетов межвоенного периода - Moth. Биплан DH.87 Hornet Moth обладает характерным для всех Moth хвостовым оперением, "Moth tail". Среди старых самолетов de Havilland до наших дней сохранился один DH.87B Hornet Moth с регистрационным номером G-ADLY. Another Selection of King's Cup Machines (1) D.H. "Hornet Moth," D.H. "Gipsy Major" 130 h.p. engine. Speed and comfort. 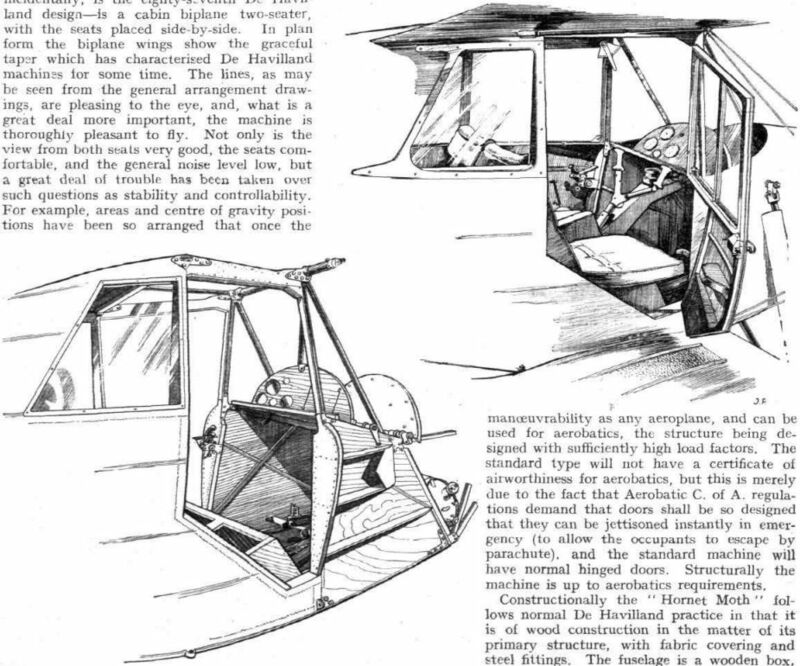 The D.H. Hornet Moth, which has very comfortable seating for two side by side. Comfort and good view in all essential directions are features of the 1936 Hornet Moth, which, with side-by-side seating is equally suitable for touring and tuition. With a 130 h.p. Gipsy Major engine, the maximum speed is about 124 m.p.h. and the cruising speed 103-108 m.p.h., according to the degree of throttling. 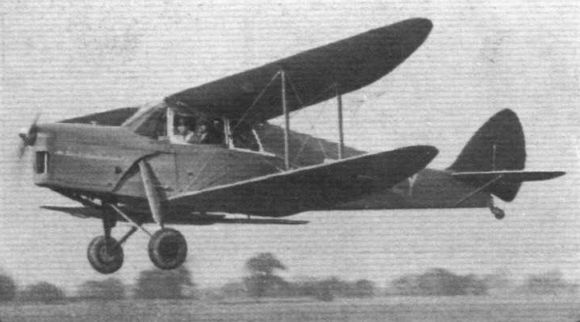 The D.H. "Hornet Moth" Two-seat Light Cabin biplane (130 h.p. D.H. "Gipsy-Major" engine). 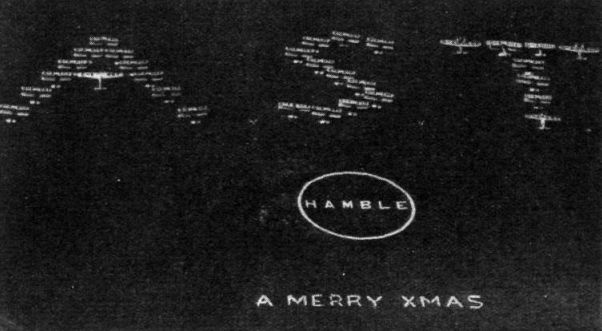 The attractive aerial view was "posed" for Flight's photographer by Mr. H. Buckingham of the De Havilland Company. 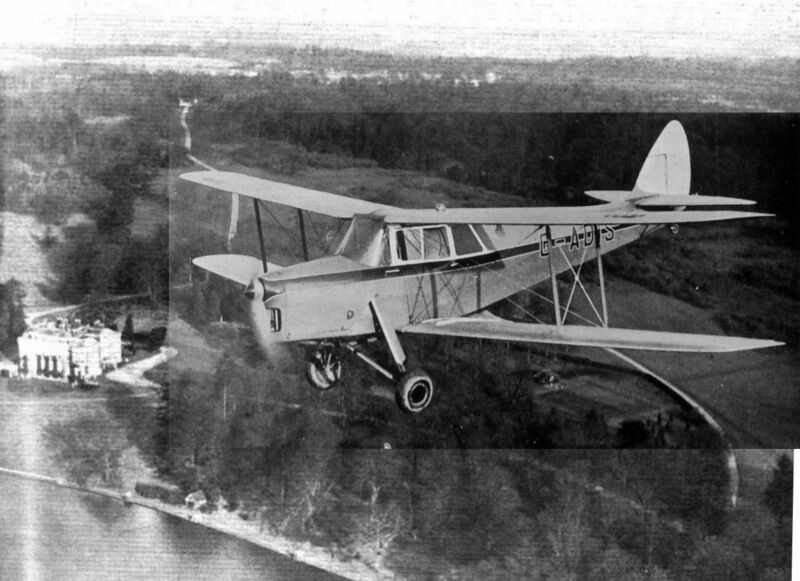 SOCIABILITY AND SAFETY: This unusual flying picture of the D.H. Hornet Moth reflects credit on the pilots both of the D.H. 87B (the official designation of the Hornet) and of the machine which carried Flight's photographer. Incidentally, its price has just been reduced to ?775 - a figure which is distinctly reasonable for a side-by-side cabin machine of this type. With a normal range of 600 miles and possessing excellent "small field" capabilities on full load, the Hornet, though not exceptionally fast (it cruises at 105 m.p.h. or a little less), is a really useful private owner's aeroplane. Its eood take-off gives it possibilities as a floatplane and at least one machine has been successfully flying in this guise over in Canada. The D.H.87 Hornet Moth was a popular Civil Air Guard type. 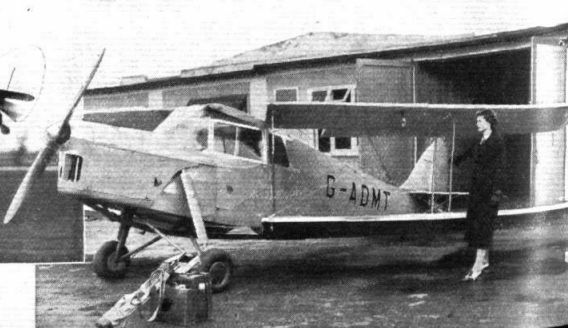 The adjacent Changes of Ownership include the Hornet Moth, G-AMZO. 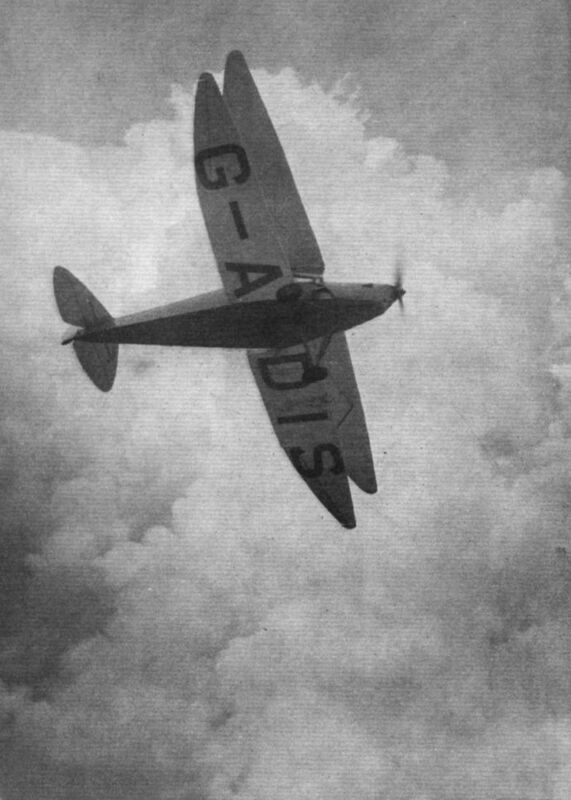 This is one of the most interesting current light planes, having belonged to the Malayan Aero Club as VR-RAI in 1936, sold in Denmark where it remained as OY-DEZ until 1942, and finally sold in Sweden as SE-ALD until registered in the U.K. in the summer of 1952. A SPECIAL HORNET: Mr. W. Lindsay Everard's new D.H. Hornet is fitted with a Reid and Sigrist Gyorizon, a drift sight and an extra locker. The colour scheme, as in the case of his previous machines, is blue and red with red leather upholstery. Of three D.H. Hornet Moths in Canada this is the only pointed-wing D.H.87A (c/n, 8031; CF-AYG). 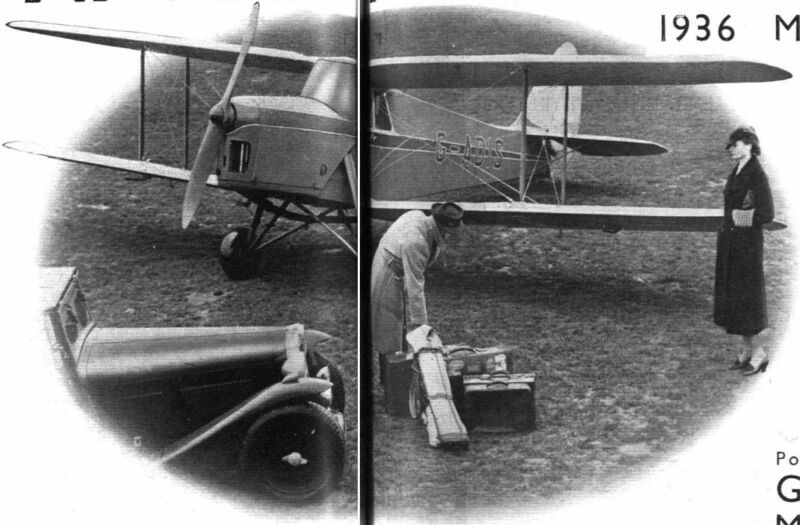 THE OLD ORDER CHANGETH: This photograph affords an interesting comparison between the 1935 and 1936 versions of the de Havilland Hornet Moth. URBANITY AT DURBAN. - A Goup of Pupils and Personnel of Natal Aviation (Pty.) Ltd. on their home airport of Durban. The company's fleet, in the background, contains a D.H. "Dragon," "Leopard-Moth," "Hornet-Moth," "Tiger-Moth" and five "Gipsy-Moth". 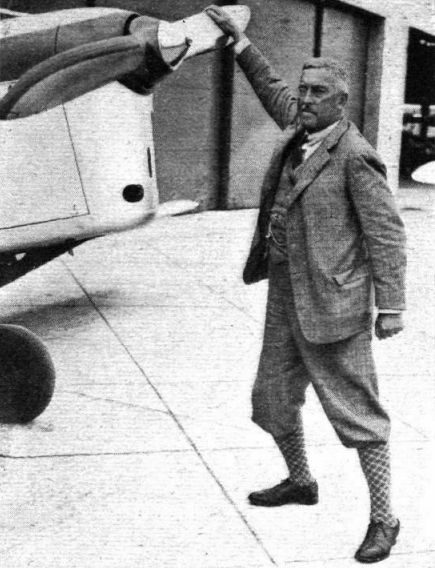 Mr. Douglas Fawcett with his Hornet Moth. An experienced mountaineer, he spends much of his time in Switzerland, flying blissfully in all sorts of weather, over, around and among the peaks which he knows so well. He is the brother of Colonel Fawcett, who disappeared while exploring the Amazon. Fig. 2: The Hornet Moth wing at 46 and 70 m.p.h. (superimposed). Odd! Photographed in Canada, the inscription on the cowl of this D.H.87B (serial 5600) reads: "Royal Air Force Transport Command, North Bay." USEFUL LUXURY: A car radio set has been fitted to a private owner's D.H. Hornet Moth by the Philco concern. Apart from its entertainment value, this equipment should be useful now that regular meteorological broadcasts are made during the day, and this photograph shows how neatly it has been installed. The Hornet is owned by Mr. Derek Schreiber. Results appear to have been satisfactory despite the lack of ignition screening.